The U.S. State Department released its final Environmental Impact Statement for the Keystone XL Pipeline to bring fossil fuel from the Canadian oil sands to the U.S.
State Department official Kerri-Ann Jones said the report concludes there would be “no significant impacts to most resources along the proposed pipeline corridor,” according to a transcript of a press conference. “However, with that statement, there are a lot of follow-on descriptions as to steps that the applicant is required to take and has agreed to take in terms of complying with all applicable laws and regulations,” said Jones, assistant secretary for State Department’s Oceans and International Environmental and Scientific Affairs. However, environmental groups continued their opposition to the project. The State Department will now hold public meetings in cities along the pipeline’s proposed route and in Washington D.C. and gather views of several other federal agencies before making a final decision. The Keystone XL Pipeline has drawn more 300 arrests in protests near the White House this past week, including Nancy Romer of the Brooklyn Food Coalition. “I’m worried about climate change,” Romer said in an interview with MarketWatch, after being asked why she took part in demonstrations. 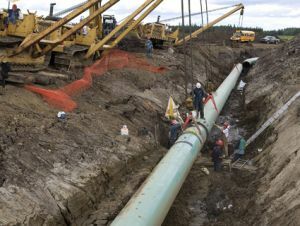 By routing fuel from the massive Canadian oil sands projects, the project will ultimately create a “huge amount of carbon and it’s non-sustainable,” she said. Romer wrote a detailed blog about her 53 hours in jail after her arrest on Aug. 20. She said she endured chilling temperatures in a lock-up with 20 other women with no beds or chairs. They used the wrappers from sandwiches in an attempt to keep warm. “We all felt it was worth it to step out and declare our opposition to policies that are killing our planet,” she said in her blog. Oklahoma will have one hearing at the Reed Center in Midwest City on September 30, 2011. The XL pipeline is another bad and sad non idea from the 2 legged. Only Satan continues to challenge the Kingdom of Jesus Christ and contribute to the downward spiral of the 2 legged mis creation in 2011, 201x, 201. The intensity of the compensation RISES. The TOOLS, MINDS and MORALITY needed to do THIS or breech the deep Ocean floors, in harmony with the Earth and it’s creations “DO NOT EXIST” and WE KNOW and ONLY THE PIGG proceeds. It is EVIL Man in 2011, 201x, 201 that uses Satan’s version of Eminent Domain to take away Christ’s creations, their homes, their way of life, and their SPIRIT across the planet. Who gave the 2 legged mis created PIGG this permission? Will the U.S. be liberated? Yes. For Satan and his midget oil disciples. Canada and U.S. will get REWARDS FOR AMBIVALENCE from the Beast. The habitats for “the disturbed” will be disturbed and Instantaneous CHANGES are FORCED upon YOUR livelihoods and children. WE RECITE and WE TRUMPET.